Since its launch in 2013, Comedy Central Studios (CC:Studios) has released several well-received web series and digital projects to complement its parent company’s TV channel, as well as its popular YouTube presence. This year, the online video production house has yet another impressive lineup of programming. CC:Studios will renew two popular web series, debut a new show, develop five upcoming projects, and see two successful series move to Comedy Central’s linear television channel. Returning CC:Studios content includes Six Guys One Car from the comedians over at the Dormtainment YouTube channel (which boasts over 800,000 subscribers). The post-apocalyptic comedy series New Timers, starring Matt Porter and Charlie Hankin (of Good Cop Great Cop) as two Brooklyn-based survivors of an end-of-the-world scenario is also set for a second season. 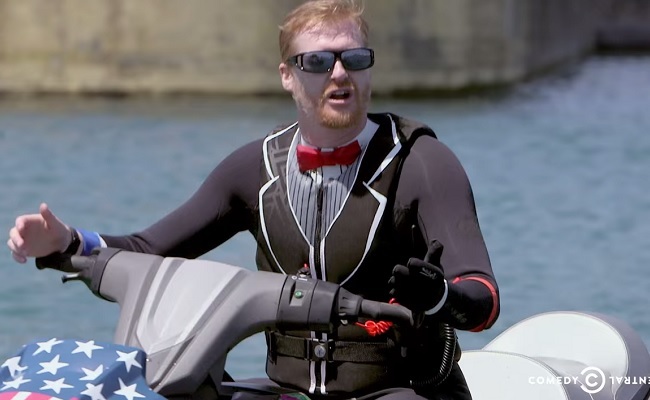 In terms of new content, CC:Studios recently debuted Kurt Braunohler’s Roustabout, a series about the comedian’s seven-city jet ski tour to help raise money so real-life legit non-profit Heifer International can send 500 goats and 1,000 chickens to Africa. In addition to Braunohler’s piece, CC:Studios is planning How to Be Friends with Everyone on Earth (working title), featuring an awkward as-of-yet unnamed Vine celebrity trying to turn his six-second videos into a full-length book. Broken People, a piece about two people terrified they’ll never find the happiness everyone else appears to have, is also on the slate for CC:Studios in 2015. Additionally, Comedy Central’s digital studio has greenlit three as-of-yet-untitled projects. A Matt Braunger initiative finds an actor named Gary as the only remaining white person in America, and a project from Rich Fulcher (of Drunk History) will take a serious look at absurd hypothetical phrases. Writer David Angelo has a piece in the works described by Comedy Central as “Seinfeld meets a sedative,” which purports to be about one man’s massive struggle in dealing with minor problems. Finally, CC:Studios can boast about its ability to create content that gets picked up by its parent company for television distribution. Two of the digital studios’ 2014 web series, Idiotsitter and Ari Schaffer’s This Is Not Happening, will debut on Comedy Central’s linear TV channel in 2015. “I am sincerely proud of how our team has established CC:Studios as an appealing destination for established and emerging comedy content creators,” said Kent Alterman, Comedy Central President of Content Development and Original Programming, in the release. Visit Comedy Central’s website or subscribe to the network’s YouTube channel if you want to catch all the comedic genius arriving from CC:Studios in the upcoming year.